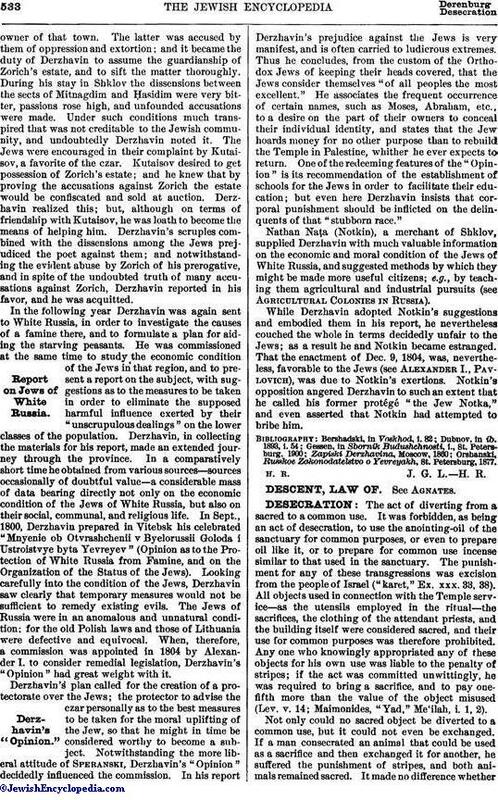 Report on Jews of White Russia. Russian poet and senator; born at Kazan July 15, 1743; died at Zvanka, government of Novgorod, July 20, 1816. In 1799 Derzhavin was commissioned by Emperor Paul to investigate a complaint made by the Jews of Shklov against General Zorich, theowner of that town. The latter was accused by them of oppression and extortion; and it became the duty of Derzhavin to assume the guardianship of Zorich's estate, and to sift the matter thoroughly. During his stay in Shklov the dissensions between the sects of Mitnagdim and Ḥasidim were very bitter, passions rose high, and unfounded accusations were made. Under such conditions much transpired that was not creditable to the Jewish community, and undoubtedly Derzhavin noted it. The Jews were encouraged in their complaint by Kutaisov, a favorite of the czar. Kutaisov desired to get possession of Zorich's estate; and he knew that by proving the accusations against Zorich the estate would be confiscated and sold at auction. Derzhavin realized this; but, although on terms of friendship with Kutaisov, he was loath to become the means of helping him. 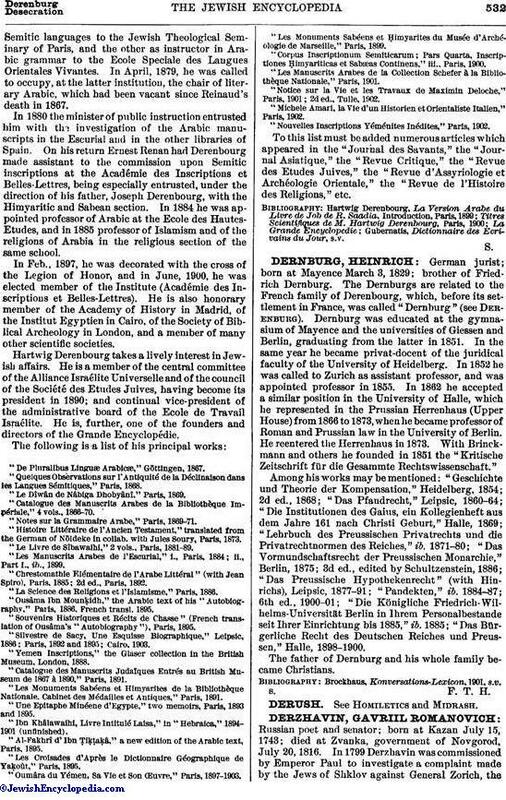 Derzhavin's scruples combined with the dissensions among the Jews prejudiced the poet against them; and notwithstanding the evident abuse by Zorich of his prerogative, and in spite of the undoubted truth of many accusations against Zorich, Derzhavin reported in his favor, and he was acquitted. In the following year Derzhavin was again sent to White Russia, in order to investigate the causes of a famine there, and to formulate a plan for aiding the starving peasants. He was commissioned at the same time to study the economic condition of the Jews in that region, and to present a report on the subject, with suggestions as to the measures to be taken in order to eliminate the supposed harmful influence exerted by their "unscrupulous dealings" on the lower classes of the population. Derzhavin, in collecting the materials for his report, made an extended journey through the province. In a comparatively short time he obtained from various sources—sources occasionally of doubtful value—a considerable mass of data bearing directly not only on the economic condition of the Jews of White Russia, but also on their social, communal, and religious life. In Sept., 1800, Derzhavin prepared in Vitebsk his celebrated "Mnyenie ob Otvrashchenii v Byelorussii, Goloda i Ustroistvye byta Yevreyev" (Opinion as to the Protection of White Russia from Famine, and on the Organization of the Status of the Jews). Looking carefully into the condition of the Jews, Derzhavin saw clearly that temporary measures would not be sufficient to remedy existing evils. The Jews of Russia were in an anomalous and unnatural condition; for the old Polish laws and those of Lithuania were defective and equivocal. When, therefore, a commission was appointed in 1804 by Alexander I. to consider remedial legislation, Derzhavin's "Opinion" had great weight with it. Derzhavin's plan called for the creation of a protectorate over the Jews; the protector to advise the czar personally as to the best measures to be taken for the moral uplifting of the Jew, so that he might in time be considered worthy to become a subject. Notwithstanding the more liberal attitude of Speranski, Derzhavin's "Opinion" decidedly influenced the commission. In his report Derzhavin's prejudice against the Jews is very manifest, and is often carried to ludicrous extremes. Thus he concludes, from the custom of the Orthodox Jews of keeping their heads covered, that the Jews consider themselves "of all peoples the most excellent." He associates the frequent occurrence of certain names, such as Moses, Abraham, etc., to a desire on the part of their owners to conceal their individual identity, and states that the Jew hoards money for no other purpose than to rebuild the Temple in Palestine, whither he ever expects to return. One of the redeeming features of the "Opinion" is its recommendation of the establishment of schools for the Jews in order to facilitate their education; but even here Derzhavin insists that corporal punishment should be inflicted on the delinquents of that "stubborn race." Nathan Naṭa (Notkin), a merchant of Shklov, supplied Derzhavin with much valuable information on the economic and moral condition of the Jews of White Russia, and suggested methods by which they might be made more useful citizens; e.g., by teaching them agricultural and industrial pursuits (see Agricultural Colonies in Russia). While Derzhavin adopted Notkin's suggestions and embodied them in his report, he nevertheless couched the whole in terms decidedly unfair to the Jews; as a result he and Notkin became estranged. That the enactment of Dec. 9, 1804, was, nevertheless, favorable to the Jews (see Alexander I., Pavlovich), was due to Notkin's exertions. Notkin's opposition angered Derzhavin to such an extent that he called his former protégé" the Jew Notka," and even asserted that Notkin had attempted to bribe him. Orshanski, Russkoe Zakonodatelstvo o Yevreyakh, St. Petersburg, 1877. H. R. J. G. L. H. R.